Bethania’s conservancy-protected lands include four hiking trails through verdant forests and preserved farmlands. The Black Walnut Bottoms Trail is a 1.4 mile trail that begins beside Alpha Chapel and extends through Black Walnut Bottoms forest and farmlands areas. The 0.7 mile Graveyard Trail begins in the Mill Shoppes parking lot and loops behind God’s Acre. The 0.8 mile Orchard Trail begins at Bethania-Rural Hall Rd. and loops through the Old Orchards preserved lands. 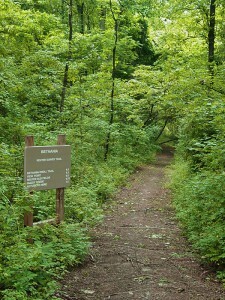 Reuter Trail, at 1.42 miles, includes a forest walk, and a loop that borders Muddy Creek. Trail maps are available in the Visitor Center, or download here.